In 2006, the U.S. and E.U. entered into a wine trade agreement, one part of which was to restrict the future use of what the U.S. calls "semi-generic trade names" like Champagne, Chianti and Port. The cool wineries in the U.S. changed wine names years ago to stop pretending to be European places that they're not. Quady winery calls its fortified red wine "Starboard." Schramsberg doesn't see any need to call its bubbly anything other than "sparkling wine." While Gallo and Korbel argue for the continued right to mislead consumers, wineries that change on their own have the high moral ground. 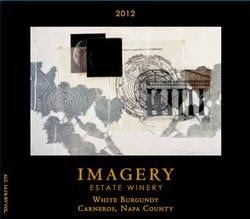 This is what surprises me about Imagery "White Burgundy." The Benzigers, who own Imagery, are generally considered good people: farmers, biodynamic pioneers, a multi-generation wine family. So why, in 2014, are they still selling a wine from Napa County called "White Burgundy?" Joe Benziger is a good guy, an enthusiast about wine and life itself. He called me on Sunday to explain. "We thought about changing it a few times," Benziger said. "We're grandfathered in. We don't have to. We couldn't find a name that we like. "The wine sells like you wouldn't believe," he said. "We don't want to break anything that's doing great. It's one of our biggest selling direct wines. I sell about 2500 cases a year, just through our wine club and through tasting room sales." "We've been making it for 20 years," Benziger said. "The recipe has stayed the same, give or take a little Pinot Meunier." Perhaps because the wine is rarely found in stores or restaurants -- you have to order it online or buy it in Imagery's tasting room -- I had never seen it until Thursday, and was shocked when I did. I emailed a photo of it to the Napa Valley Vintners, Sonoma County Vintners and BIVB (Burgundy Wine Board) to ask what they thought. Sonoma County Vintners did not respond. The BIVB was not happy; a spokesperson said, "The specialists confirms that this is illegal. Thanks for the info. We will contact INAO." But I didn't know at the time that Imagery had been using the name for 20 years, so it is probably not illegal. Napa Valley Vintners' response was interesting. The label above shows "Carneros, Napa County" as the region for the 2012 wine. Napa County is not the same as Napa Valley. That may be a significant difference. "NVV believes very strongly that producers should respect and protect winegrowing place names and that location matters when it comes to wine," said Napa Valley Vintners communications director Patsy McGaughy. "In fact, we've fought all the way to the US Supreme Court to uphold this principle. Even if this label is technically allowed, we would urge the producer to use Chardonnay, not White Burgundy." Should Imagery change the name of its "White Burgundy?" NVV's opinion is not binding because Imagery, based in Sonoma County, is not a member. Moreover, Benziger said that in future vintages, the Chardonnay in the wine will be sourced from Sangiacomo Vineyards in Sonoma County, so the appellation may change. The Pinot Blanc and Pinot Meunier will still come from organic Yountville Vineyard in Napa Valley. What do you think? Let's vote. And let's help out Joe Benziger: Please leave some suggestions for a new name in the comments. Just drop the word Burgundy which today, on a domestic wine, implies a lesser pedigree; 70's jug wine. Imagery White has a nice ring. The people who have been buying will continue to do so and it may gain some customers. If it says Burgundy on the label, there should be Burgundy wine in the bottle - pretty easy to understand really. Almaden "California Mountain White Chablis"
Almaden "California Mountain Rhine Wine"
Italian Swiss Colony "California Chablis"
Italian Swiss Colony "California Chianti (Red)"
Italian Swiss Colony "California Sherry"
Italian Swiss Colony "California Port"
I totally agree with the comments from all three readers. Bob Henry has it right. These wineries are "wannabes". Their product doesn't stand on its own merit, so they conjure up a name from a place that does have decent quality wine and panhandle it as something its not. I guess that makes me a wine snob, but so be it. Maybe change it to Imaginary White or even Imaginary White Burgundy. If they leave out the Pinot Meurnier would they call it Corton Charley? Pretty sure there is still a bit of Pinot Blanc planted in Corton. Mirassou Winery used the term White Burgundy for many years throughout the 80's and early 90's for their Pinot Blanc bottling. Also to be Carneros Napa County is likely labeled as such due to that the wine is 85% or more from Carneros ,but Napa Valley portion is less than 85% required to have Valley vs County. It is likely that the balance is from the Sonoma side of Carneros (the only appellation that extends thru two counties). A wine that lists Napa County has to be 75% from Napa where as a wine has to be at least 85% to be labeled Napa Valley. There is very little land in Napa that doesn't fall under Napa Valley. Quite different than the Sonoma Valley appellation which is only a small part of Sonoma County. "Napa County is not the same as Napa Valley, though to my knowledge all of Carneros is in Napa Valley. That may be a significant difference." Maybe you should look at a map?? Carneros is in both Napa AND SONOMA Counties, and Napa Valley does not extend into Sonoma COunty. But how about Uruguan Cognac???? Licensed by the same overly protective French??? Imagery = Benzinger = "Glen Ellen Winery" from back in the 80's before they sold. Glen Ellen was the first major offender in mis-using the term "Proprietors Reserve" on bulk grade products back in the 80's, to my knowledge. I know because I was fooled into buying some because of that designation. Seems they have no respect for the aspect of heritage in the wine business so this is no surprise to me. Tony, you're right, it was a slip, I was going to make the point that all of Napa Valley is in Napa County and just mistyped. Now in editing I realize I don't need that either and just took it all out. Interesting article. Do you know how long Californian wines are permitted to be labelled in this way? Writing in Australia where European labels were long ago dropped for table wines and more recently for fortifieds (in the latter case replaced with some rather less catchy categories such as apera for sherry), it seems remarkable that it's allowed. Sean: There are ongoing trade negotiations but Gallo is heavily invested in fake place names and Gallo is extremely influential in U.S. wine trade policy. Not unfairly so, as they are not only our biggest wine producer, but also our biggest wine exporter. That said, Europe would do a better job negotiating directly with Gallo rather than dealing with U.S. trade reps who will never budge on this issue without Gallo's approval. Imagery could, if it chose, publicly renounce the fake place name, take the high moral ground, and put a little public pressure on Gallo.